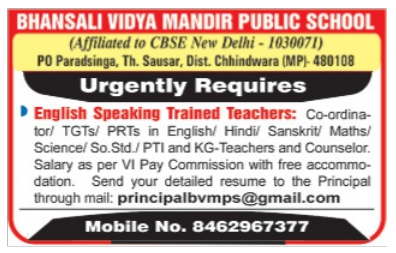 Bhansali Vidya Mandir Public School, Chhindwara has advertised in THE HITAVADA newspaper for the recruitment of Teachers jobs vacancies. Interested and eligible job aspirants are requested to apply by earliest. Check out further more details below. About School: A noble venture of the Bhansali Education and Social Welfare Society came into existence in July' 1992 at Bhansali Nagar a township developed by Bhansali Engineering Polymers Ltd. Today this school can justifiable be proud of an ambience of its own. Affiliated to the C.B.S.E., New Delhi, it is a co-educational institution of All India character providing quality education to children from pre-primary to class X. Location and Campus :- The school is situated on the Nagpur- Chhindwara highway. It is about 50 kms. Away from Nagpur and about 75 km from Chhindwara. The school is sprawling over a campus of five acres. It is surrounded by agricultural farms which provide an excellent pollution free environment for the children to learn and grow in the most natural atmosphere.